Locks 2 and 3, a pair of twinned narrow locks known as Hillmorton Bottom Lock, on the Oxford Canal, built in 1840 on the site of the original single lock constructed in 1769-74. The locks are lined in red and blue brick, with heavy stone capping to the northern end; the remainder has later bull-nosed concrete and blue brick capping. The locks are parallel to each other, allowing traffic to pass through both locks at the same time. Lock 2 retains its cast-iron gates installed in 1840; the rest are later timber replacements. A paddle between the two locks allowed water to pass from one to the other, to save water; the gearing remains in situ at ground level between the two locks. The quadrants to either side have been recently resurfaced in modern red and blue brick. HISTORY: The Oxford Canal was constructed in several stages over a period of over twenty years following the passing of an Act of Parliament authorising its construction in 1769. It was intended to link the industrial Midlands to the River Thames and so to London. The canal was originally overseen by the distinguished canal engineer James Brindley until his death in 1773, after which his assistant Samuel Simcock took over, taking the first phase (from near Coventry to Napton) to completion by the following year. In order to undertake the remainder of the construction it was necessary to pass a second Act of Parliament in 1775, following which the canal was completed as far as Banbury by 1778, though due to ongoing financial problems, the final stretch could not be begun until 1786. This latter stage was built as cheaply as possible to preserve funds, and was formally opened on 1 January 1790. 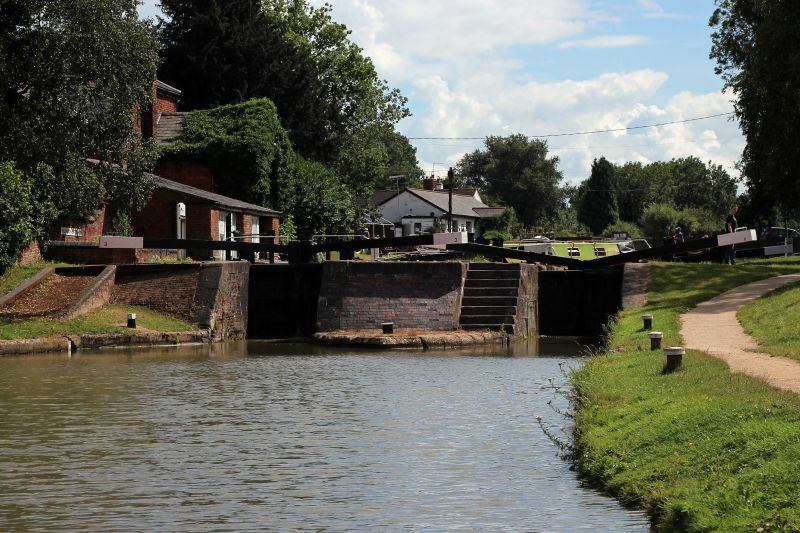 It was initially very successful, providing a fast route for commercial traffic, but in 1805, a more direct and therefore faster route between the Midlands and London, the Grand Junction Canal, was opened, taking much business from the Oxford Canal. The canal was originally built as a contour canal, running around hills to avoid as far as possible steep changes in level and the need for locks. In the face of competition from the Grand Junction Canal and the nascent railway network, from the 1820s, plans were afoot to straighten some stretches of the canal and thereby reduce travel time. In May 1834, a shortened length was opened immediately south of Hawkesbury Junction at the northern end of the Oxford Canal, and this resulted in a large increase in traffic. It immediately challenged the capacity of the flight of three locks at Hillmorton, the first on the canal after the stop lock at Hawkesbury Junction. The solution to the congestion was to duplicate or twin the existing locks at Hillmorton, creating three pairs of two parallel narrow locks, which allowed for twice the traffic to pass the lock at any time. The work to double the locks was completed on 25 August 1840; each was supplied with large, cast-iron gates, as opposed to the more usual timber gates. The project to improve Hillmorton was particularly expensive, costing some £4,200. Not only was the capacity to pass the lock doubled, but the time taken was decreased as the locks were narrower; the fastest test showed that the locks could be operated in as little as one minute and 20 seconds. The locks were designed to act as mutual side ponds, too, with a paddle between the locks enabling water to be transferred from one chamber to that adjacent, thereby saving water. The improvements allowed a large increase in traffic, with 20,859 vessels passing through the Hillmorton Locks in 1842. The northern stretch of the canal, as far south as Napton, continued to be an important trunk route mainly carrying coal from Warwickshire towards London, and carried heavy freight traffic until the 1960s. In common with most other canals, its profitability decreased dramatically from the 1950s, and latterly the canal has become popular for leisure rather than commercial activities. The locks at Hillmorton have been much restored since the 1980s, and all of the cast-iron gates have been replaced with timber examples, with the exception of those in Lock 2.